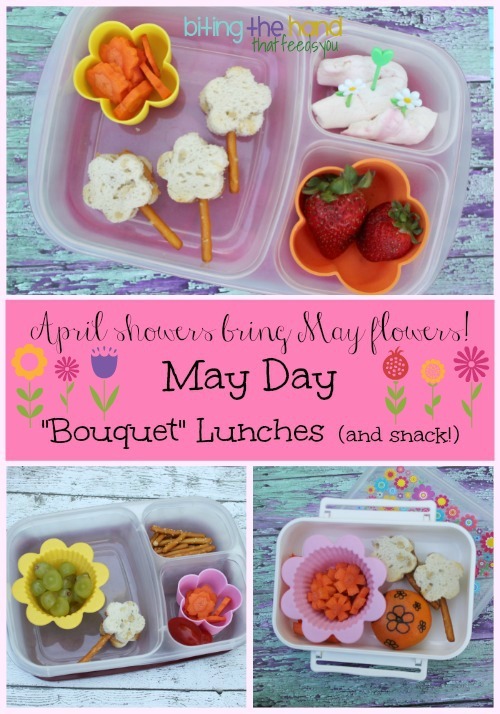 Monday, 5/1/14 - I made flowery "bouquet" lunches for my girls for May Day, plus a snack to share at the playground after school! I made flower sandwich "wands" using a large flower veggie cutter and glued gluten-free pretzel sticks in between the bread slices using gobs of peanut butter. Neither girl has really been eating their sandwiches lately, and I figured (correctly) that making these flowers with stems would make them super fun to eat. I cut a carrot stub with a small flower veggie cutter, then cut that into coins and put them in a small silicone flower cup to keep with the flower theme. And a few lone strawberries in a medium silicone flower cup. My plan backfired, as I forgot that Z had a midday appointment, and that the girls would be eating side-by-side in the car. E was upset that she didn't have any "mah-mawwoes" and Z was miffed that she didn't have any extra pretzels. *sigh* Luckily they were both happy to share! Since the weather has been so nice lately, the girls like to stay and play on the playground after Z gets out of school. But Z starts whining that she's hungry, which sets off a little "I'm hunry" toddler copycat. 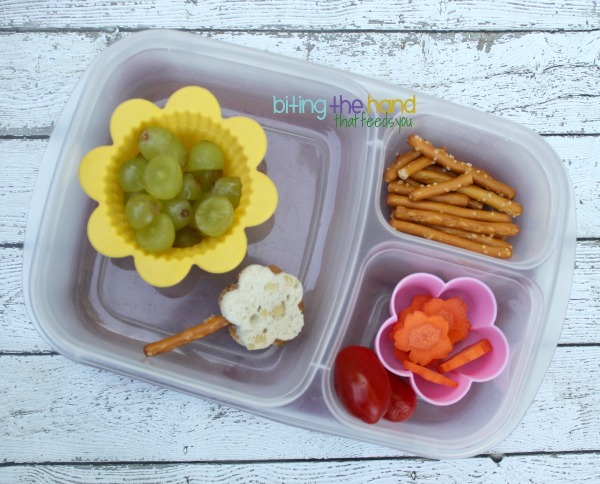 Even though Z usually has leftovers in her lunch, after watching them squabble over some twice-rejected grapes and carrots that I then offered to the toddler, I decided to try and pack something that they have no choice but to share! I hand-cut notches into the rest of the carrot, that was too skinny to use the veggie cutter on. 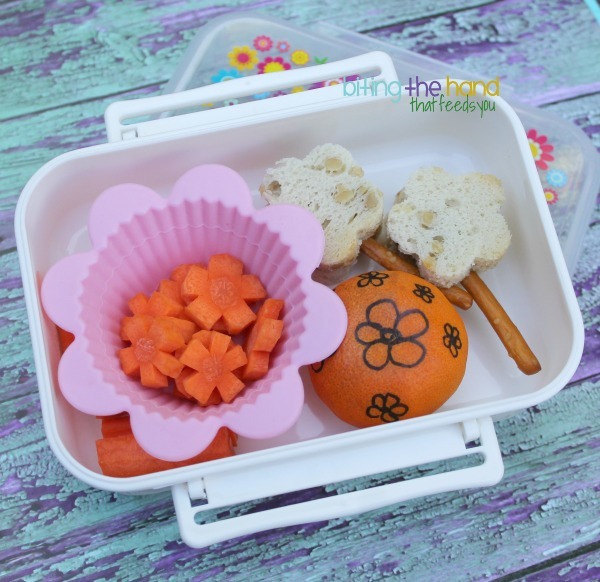 I put the flower coins into a flower muffin cup, and tucked some carrot sticks in behind. I used a Sharpie on a clementine peel to make more flowers, and added a few extra sandwich wands. 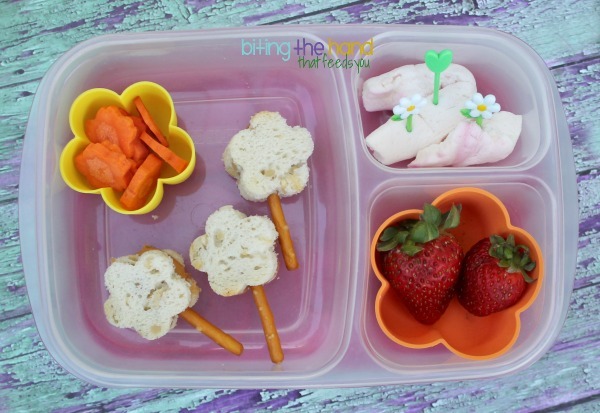 Absolutely gorgeous lunches, I love the pretzel stick wands, they're brilliant!